Finally, one of my most anticipated reads of 2017 that did not disappoint! 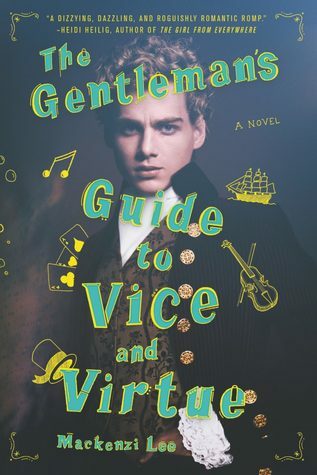 The Gentleman’s Guide to Vice and Virtue was on my radar ever since I saw it described as a tale of two boys going on a road trip through seventeenth century Europe, fighting pirates and their feelings for eachother along the way. And oh boy, it didn’t only live up to all my expectations, but it managed to surpass them and surprise me along the way. How much do I love this? Let me count the ways! Monty as the narrator. I fell in love with Monty pretty much right from the start, even though he didn’t always make it easy for me. It’s true that Monty is quite self-centered and privileged. He’s a rascal and a drunk, rarely says the right thing and has numerous flaws, but he’s also charming and witty and compassionate and above all, he listens when he’s called out on things and he learns and grows from it. Also, his tone of voice was just so funny and his observations both made me laugh and cry. Hello, new OTP! Monty and Percy are adorable. Having been best friends for their entire life, Monty has had a secret crush on Percy for a while now and is hoping that their year-long trip may help in them becoming more than friends. Friends-to-lovers is one of my favorite tropes, but it felt really done perfectly here. The slow-burn is exquisite, the pacing just right, the chemistry palpable and the emotions tugging on all my heartstrings. Felicity, my hero. Joining Monty and Percy on their trip is Monty’s sister, Felicity. And I love her so much! She’s brilliant and doesn’t take any crap from anybody. She suffers a lot under the restrictions and beliefs of this time period and its society that want her to be an obedient girl without any intellectual pursuits, but she handles it all brilliantly and I am in awe of her. The historical issues discussed. This book felt very true to the time period in that it not only showed the glitter and glamour often portrayed in movies, but also the tough things that almost go hand in hand with that time, such as homophobia, racism, slavery, sexism and the social stigma of chronic ilnesses. We also encounter parental abuse as well. All of these issues are called out by one or more of our lovely protagonists though. But even so, these characters still deal with their own internalized prejudices and they always feel very real and true to the time period. I never once had the impression that they were present-day characters with present-day beliefs transported back in time. Which could have easily happened, but didn’t, and I love this book all the more for it. The fast-paced, action-filled plot. This book surprised me constantly. Things I hadn’t expected AT ALL happened constantly and I never could have guessed the direction the story went in. As the characters jump from adventure to adventure, there wasn’t a dull moment in sight. The pacing felt absolutely perfect and the adventures had me engaged and eager to keep reading constantly. My only nitpick about the whole story was the ending. I was expecting this to be way longer and was fooled by the author’s note into thinking the ending was still a few pages away. As such, it came too suddenly for me and I would have loved some more resolution on a few things. But I did find out afterwards that a second novel in this world is coming, narrated by Felicity and I think this will help me with my need for some more resolution AND my desire to have more Felicity. So of course I’m thrilled about that! In conclusion, I can only say that the hype is real. This is one of the best books I’ve read in 2017 and I’d absolutely recommend it to everybody. You simply must meet Monty, Percy and Felicity, as they are one trio you won’t soon forget! Have you read The Gentleman’s Guide To Vice And Virtue? What did you think about it? I literally haven’t seen any negative reviews of this book yet. It only makes me want to get my hands on it that much more! I know right? Hope you’ll enjoy it just as much! I just finished reading this book today and thought it was absolutely brilliant for pretty much all of the reasons you’ve mentioned. Definitely one of my favorite reads of the year so far!